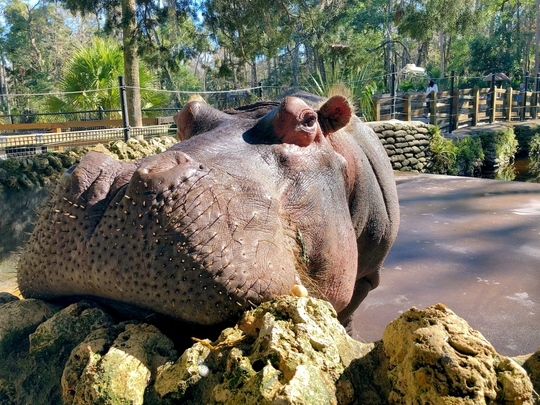 HOMOSASSA, Fla. – The Florida Department of Environmental Protection’s Ellie Schiller Homosassa Springs Wildlife State Park celebrated the 59th birthday of Lu, its resident hippopotamus, with two special birthday events today. "Lu delights visitors of all ages and helps us encourage our visitors to learn about Florida's unique natural environment," said Park Manager Kim Tennille. "We are happy to give him a great birthday party in return for the happiness he brings our visitors every day." A longtime resident of Homosassa Springs Wildlife State Park, Lu attracts visitors from around the world. Students from several local elementary schools joined park staff in wishing Lu a happy 59th birthday with a special birthday song, written and performed by park volunteer Vicky Iozzia. Lu enjoyed a birthday cake made specifically for a hippo. In the afternoon, another party took place during the park’s alligator and hippopotamus program, so park visitors had another opportunity to join the birthday celebration of Florida’s only resident hippopotamus. A giant birthday card was available for visitors to sign to wish Lu a happy birthday. Lu's fans around the world can also send him a birthday greeting on his Facebook page. Lu, an African hippopotamus, was born at the San Diego Zoo on Jan. 26, 1960. Like all hippos, Lu is a vegetarian and his diet consists of alfalfa hay and assorted vegetables and fruit. Hippos typically live from 40 to 50 years old. At 59, Lu is the oldest hippo in North America. A fixture at Homosassa Springs since 1964, Lu was a movie and television star with the Ivan Tors Animal Actors troupe, which wintered at the park while it was in private ownership. His credits include the 1960s movies "Daktari" and "Cowboy in Africa," and television specials such as the "Art Linkletter Show" and "Herb Alpert Special." For more than five decades, Lu has been a mainstay among the animals at Homosassa Springs Wildlife State Park. When the Florida Department of Environmental Protection’s Florida Park Service purchased the attraction in 1989, the state planned to shift the emphasis of the park to native Florida wildlife and find homes for all of the exotic species, including Lu. Public support, however, led the state to grant Lu special Florida citizenship in 1991. Since then, he has become an icon at the park, attracting visitors from around the globe.